When Pria (Charlize Theron, lured here I presume because she had so much fun with MacFarlane on A Million Ways to Die in the West, like Liam Neeson last week) announces to the crew that she is actually a time-traveler from the 29th century who came back to save and then steal and sell what was the doomed-to-destruction-had-she-not-intervened Orville, my mind immediately went to the con man in TNG‘s "A Matter of Time," and I blurted out to my wife, "Star Trek already did this episode too!" I realized in that moment that I had essentially become the annoying kid Dougie in the South Park episode, "Simpsons Already Did It." This plot was new to my wife; she’s never seen "A Matter of Time" or indeed any of the Trek plots that have been repurposed so far for The Orville. Maybe I just need to let it go already. 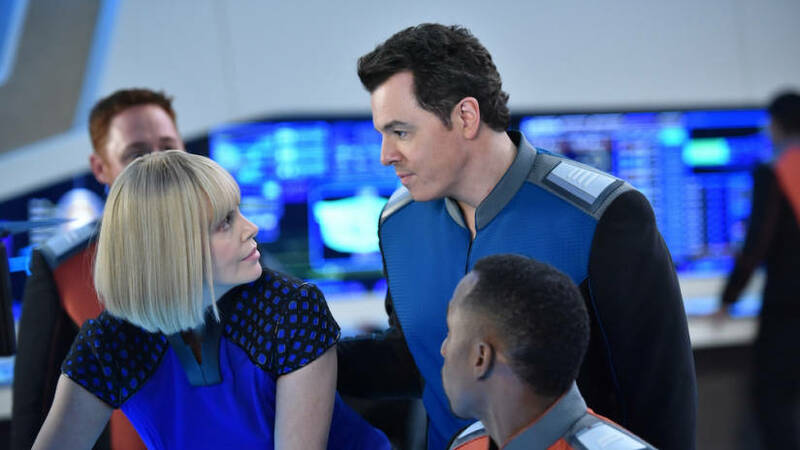 Granted, this is an ongoing liability with The Orville, which is that these stories can sometimes seem like reheated Trek leftovers and thus distract from themselves, even when that critique really isn’t fair (and it’s not here). "Pria" does enough of its own stuff to be its own thing, and it does it fairly entertainingly — a marked improvement over last week’s tepid "If the Stars Should Appear." Granted, it still sorely lacks conviction in its semi-dramatic intentions (and the sci-fi is fine if unambitious), but it’s a more enjoyable effort for sure, and possibly the most purely enjoyable Orville episode so far.